SuperMemo 17 introduces a new form of incremental learning, which we will call neural learning. In neural learning, SuperMemo serves the student with knowledge associated with a selected subject, article, picture, etc. Knowledge is served in a neural way, i.e. 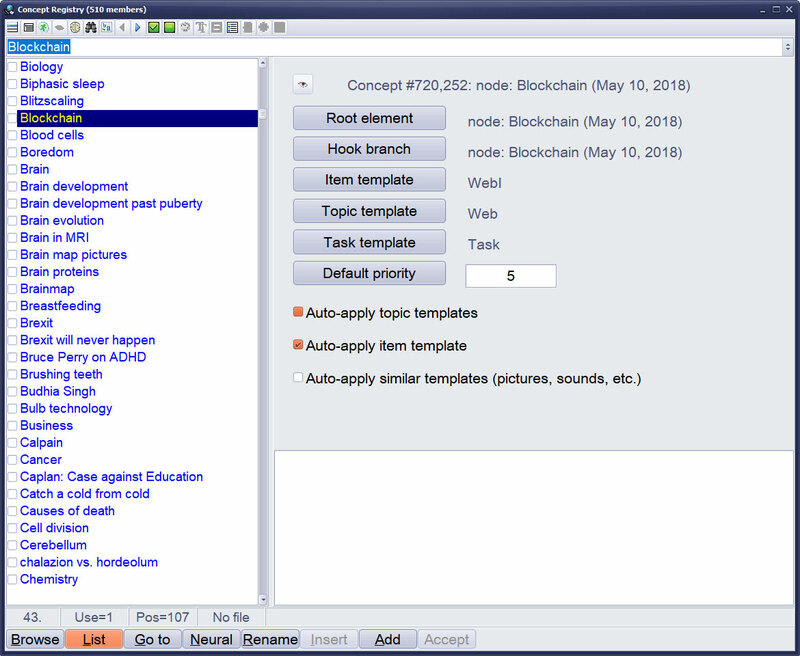 by sequentially exploring semantic connections in a networks of information build automatically or manually in SuperMemo. SuperMemo takes inspiration from how the brain works. Creativity enhanced with SuperMemo is very slow, but it is targeted and methodical. Neural creativity works like a slow brain extended by memories stored in SuperMemo. Neural learning is particularly useful in research, problem solving, creative writing, explorative learning, etc. In other words, you may not find neural learning particularly useful in mastering a course of physics, however, if you are a physicist working on a complex problem that requires associating knowledge from different fields of physics and beyond, you will notice that this form of learning has a fantastic impact on your creative productivity. Neural learning was the main reason for SuperMemo 17 to introduce a new type of elements: concepts. A concept in SuperMemo is an equivalent of an important idea, which can be connected with other elements (incl. other concepts). In addition to connections between concepts, neural learning also explores connections between elements using the knowledge tree. Elements connected via concepts form concept maps, which, in addition to the knowledge tree, from the primary skeleton for explorations in neural learning. In the following sections, the essential terms and notions underlying neural learning will be introduced gradually: concepts, spreading activation, neural review, etc. Even if this may sound overwhelming at first, remember that you can start neural learning now with just one keystroke: Ctrl+F2 (Go neural). The following sections are only to explain how neural learning works and how its mechanisms can influence your decisions to make it work best for you. A concept in SuperMemo is an element associated with an important idea. A concept can serve as a bookmark, as a root of a branch associated with a given subject, as a hub for connecting different portions of a collection, or as a starting point for a creative process (e.g. writing an article, solving a problem, etc.). Concepts can be linked with other elements. The network of links based on concepts will be called a concept map. 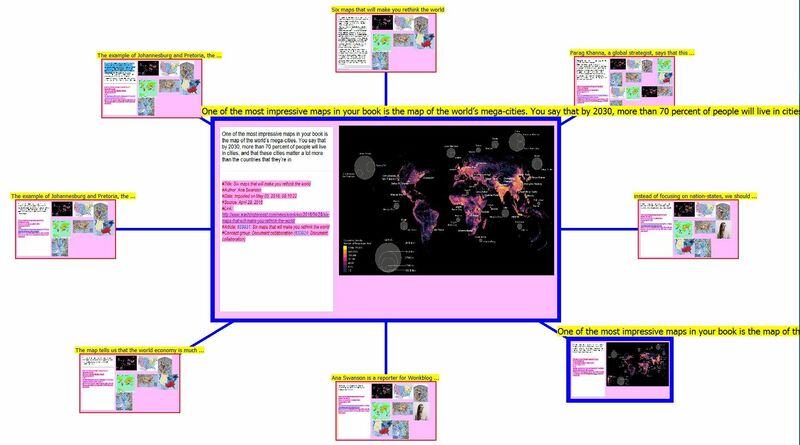 See: Concept maps at Wikipedia. To convert an element into a concept, use Concept: Make in the Commander. To convert a contents element into a concept, press Ctrl+K in the Contents window. Each concept element has its corresponding concept member in the registry. Each concept group is based on a single concept element. Some concepts (elements and member) are created primarily for expanding the knowledge tree (via a concept group). Other concepts (elements and members) are created primarily to form concept maps for neural learning. Concepts can play both roles: tree tools and concept map tools. When you work with a collection which includes material belonging to different subjects, you may want to keep different subjects in different sections of the knowledge tree (in the Contents window). You may also want to design a different look for items related to literature, and a different look for questions related to mathematics. For example, you could use pictures to illustrate your anatomy branch, sounds to illustrate your foreign language section, spell-pads to make your spelling section work best, etc. To help you organize different subjects in one collection, SuperMemo uses concept groups. A concept group can be seen as a tool for building a section of the knowledge tree. One concept group is used for adding material related to one subject. Elements added to a given concept group may use their own template that determines their look (e.g. images, sounds, colors, fonts, sizes of text fields, number of shape components, etc.). See: Using templates. In older SuperMemos, the role similar to concept groups was played by categories. Concept registry is used to keep the sorted list of concepts. Each concept element is associated with a concept registry member. Concept registry makes it easy to find concepts, esp. when you want to link an element with a particular concept. Choose Search : Concepts from the main menu to open the concept registry. All inter-element links are stored in a dedicated link registry (available with Search : Links from the main menu). Link registry is functionally similar to concept registry. The main difference is the greater significance of concepts as compared to links. You are likely to use concept registry often when making conceptual links. This why it is important to keep it less crowded and with good searchable name standards. To make inter-element links, you will rather use the Contents window. Only concepts can be used to group elements in branches (with concept groups). Links cannot play a similar role and do not appear on selectable concept group lists. In addition, concept links get much greater weight in spreading activation in neural review (see below). Neural review is a subset review that follows meaningful connections between pieces of knowledge. It takes inspiration from how the brain follows associated ideas. Neural review automates the review of knowledge associated with selected concepts or ideas, e.g. in problem solving, creative writing, etc. For example, in a neural review of dogs, there is a good chance of learning about puppies or pooddles, but there is also a chance of learning about cats and somewhat lesser chance of learning about cars. Similarly, if you see a picture of a banana plant, going neural on that picture will help you review associated elements (e.g. other pictures of plants, or articles about bananas, or elements associated with the same concept such as gardening). A concept in SuperMemo is an important idea or subject. Concepts are a new type of element that can be linked with other elements. The network of links based on concepts will be called a concept map. Elements can also form links between each other. In SuperMemo, knowledge is also connected by inheritance, and the structure of the knowledge tree. Spreading activation in neural networks is a method of searching the network with the use of network connections and weights. Neural review follows the spread of neural activation in a network of inter-element connections. All the links and connections in SuperMemo can be used to simulate a spread of activation in the network of knowledge where individual elements play a role of neurons. All links used in spreading activation receive weights based on their importance. In SuperMemo, weights are determined by element priority and the priorities of individual knowledge associations (e.g. concept connections are of higher priority than the sibling relationship in the knowledge tree). In spreading activation, we can sequence the propagation wave by the time of activation of individual nodes, which are formed by SuperMemo elements. Such a sequence can then be used as the basis of a semantic review in the incremental learning process. Neural review can be initiated by executing Learn : Go neural (Ctrl+F2) from the main menu. Neural review carries a degree of randomness. As such it can be very helpful in associating ideas in neural creativity. Connectivity and randomness underlie the main rationale behind neural review: neural creativity and neural problem solving. In those approaches, we combine a creative process or a problem solving process with an exploration of new subjects, while executing incremental learning in the background. In other words, neural review serves learning that is to instantly bring benefits in the shape of new ideas and new problems solved in conditions of incomplete human knowledge and in combination with abundant and possibly contradictory computer-stored knowledge. A typical use of neural creativity would be to diagnose a rare disease on the basis of its symptoms (see examples). You can try neural learning on your own now. All you need is SuperMemo 17 and a rich collection. Small collections won't show the power of neural learning. If you start with a single article, neural review makes sense only if your article has already been splintered into smaller pieces. You can also do Split article if this is a newly imported article, however, in that case your sub-articles need to be outstanding. This is because neural review ends if the neural queue contains elements that have all been reviewed/imported/created on that given day. This means that for a newly split article, you need to use Add to outstanding or wait a day (for sub-articles to "mature" for review). While in neural review, use the button Learn as in normal learning. While learning, the Review parameter in the Statistics window shows Neuro=[Size], where Size is the number of elements in the neural queue. The size of the queue is limited for practical reasons. You are not likely to go beyond a few hundred elements in a single review. Moreover, at each repetition, more layers of the conceptual networks are explored and the queue keeps being expanded in parallel with your learning. To end the review, press Esc. The Review field in the Statistics window is cleared. If you worry about the cost-vs-benefit equation in building concept maps in SuperMemo, remember that properly executed incremental learning builds a semantic structure of the processed knowledge in the shape of the knowledge tree. Parents, siblings and children are related to each other in terms of their meaning. Concept maps are the chief framework for spreading activation in neural SuperMemo, but the knowledge tree also forms a fine dendritic framework that helps you capitalize on all your prior work with incremental learning. If you are familiar with mind maps, you will be happy to know that the cost of building your concept maps is far less. At times, all you need for your creative purposes is a conceptual link between two different subjects where you expect to find creative associations. To execute your neural review or to engage in neural creativity, pick your concept, element or a registry member (e.g. a picture) and Go Neural. Concepts and inter-element links form the primary framework for spreading activation. The knowledge tree comes next. Activation might actually be infinite if it was costless. SuperMemo goes into just a few layers of activation in a single repetition or when building the neural queue for the first time. This takes milliseconds on a fast PC, but might drag for a second on older computers. SuperMemo adds more layers of activation in successive repetitions. Those can be useful for remote associations, but you are unlikely to go through more than just a layer in a single session. The queue then becomes a tool for building your understanding how the activation is spreading in the network. For example, if you are a doctor who is to make a diagnosis for a specific patient, you can set up a diagnostic concept and link chief suspects in a concept map. Go neural to see what new ideas come to your mind while learning new topics at the same time. To get a feel of how activation spreads from a given element, use View : Neural queue (from the main menu) to see an exemplary neural sequence associated with the current element. Note that this sequence will differ each time you create a new queue. Spreading activation is subject to "race conditions". This means that neural impulses race each other and the outcome may be different on each occasion. As much as your brain has "moods and modes", so does the neural review in SuperMemo! Neural review will go through the sequence determined by spreading activation. In that activation, concepts have higher priority than links, or knowledge tree. However, knowledge tree will be participating as well (with lower weights). Activation will spread slowly to unrelated sibling articles whose relative priorities will increase in absence of children, concept links, and the like. In other words, only small collections will make neural review pointless. Concept maps are not obligatory. This is the status for Feb 26, 2016. The sequence, priorities, and other parameters will change in the future. It all depends on user feedback and field tests. "How can interruption be good for creativity or problem solving? Isn't it that all great discoveries come from continual, persistent and focused effort? It is those who can dedicate themselves to a cause that achieve best results. Most people fail because they major in minor things. They do many things superficially. They are jacks of all trade and masters of none. Incremental learning seems like an effort to major in everything. Putting too much on one's own plate". This question keeps popping back in various contexts. Here is an illustrative answer based on the fact that creativity and problem solving are based on forming new connections in your brain. Imagine you had a very eventful day. For example, a visit to an exotic city, meeting an old good friend, or attending a breakthrough conference. Imagine that your inspiration is so rich that you want to write a detailed report of the day (assuming you did not capture it all with Google Glass). The first thing to do is to sit down to writing a report and list all essential keywords for rebuilding the memory of the day. Once you write the outline, you can quickly notice that it does not take long before you come up blank for new memories. You cannot recall any more details. This is normal. Sitting down over a blank piece of paper for an hour may not be the best use of your time. It may be pretty unproductive. However, if you keep your piece of paper handy, you may notice that it keeps filling up with new memories as they keep popping up in your head in different contexts. An image, a smell, or an article in press may all contribute to unexpected recall. If you happen to execute incremental learning in the meantime, you will notice that the process of recall is intensified. If your learning materials are rich, you are likely to read about dozens of unrelated subjects in a single day. All those subjects produce new associations. Your blank piece of paper will fill up much faster than it is the case in the course of ordinary life or if your learning was less varied. What you witness here is incremental recall. new memories and/or ideas you have not experienced or thought of before. Finally, in problem solving, you will direct this creative process towards accomplishing a specific task: solving a problem, answering a question, etc. zeroing in on the ultimate diagnosis. Neural review has already been helpful in solving problems that pester users of SuperMemo (e.g. misaligned cloze deletion, due to bugs in Internet Explorer). When a pesky problem shows up, all ideas and new areas of related knowledge can be associated with a concept that defines the problem (e.g. cloze bug). In the case of the "cloze bug", several users sent their ideas on how to possibly solve the problem. None of these worked. In the end, all DOM-related ideas turned out to be a blind path. However, initiating neural review provided an ultimate incentive with a hope for a light in the tunnel. Could the problem be solved without neural review? Yes. Perhaps, neural review helped step out of the box in looking for solutions? If not, it might at least have had a psychological effect: "if nothing works, perhaps neural review will?". Incremental writing is useful if you want to compile a number of texts into a larger body. Neural approach may be useful if you want to combine that procedure with a degree of research. You may either want to research a topic (e.g. when looking for facts or literature related to your thesis), or research your own texts if they are too voluminous and highly repetitive (e.g. to look for simpler phrasing, more logical sequencing, clearer line of thought, etc.). Forensics is an excellent example of where neural approach may appear useful. A complex case may involve a great deal of case-specific knowledge that needs to be combined with scientific and general knowledge. Wherever the size of knowledge goes well beyond the capacity of human memory, and where the solution may require thinking "out of the box", neural approach may act as an extension to the human mind. Once a case is solved, case-independent knowledge may be integrated with the main learning collection to secure the long-term investment in knowledge.